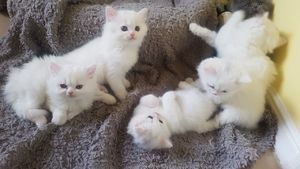 Beautiful pure snow white persian female kitten left from litter of 6. Fluffy and very playful. Kitten is fully house trained and litter trained. Mum and dad are available to see on viewing. Kitten is ready to leave to her new loving home. Indoor home only thank you.